You've got to give "Rough Cut" credit for paying homage to its sources. It begins with Burt Reynolds doing his imitation of Cary Grant, and, indeed, this is just the sort of suave thriller Cary Grant might have made, complete with its several references to films by Alfred Hitchcock. Reynolds is playing in the right league - he can mix subtle eroticism and sly wit in ways that do sometimes remind us of Grant - but the movie itself doesn't quite make it. It's fun, it's slick and it's carefully put together, but it's more of an exercise than an accomplishment. Everyone does their schtick, the plot complications unfold like clockwork, but we find ourselves not really caring. That was the thing about Hitchcock: He often reached technical perfection, but rarely at the cost of involving us on a gut level. The director this time is another Hollywood master, Don Siegel, whose biggest successes recently have starred Clint Eastwood. Siegel's very good at action pictures, but when he lets up on the reins a little, as he does here in an attempt at a sophisticated tone, the movie has a tendency to go flat. There are moments when "Rough Cut" is just marking time, and a thriller should never give us that feeling. 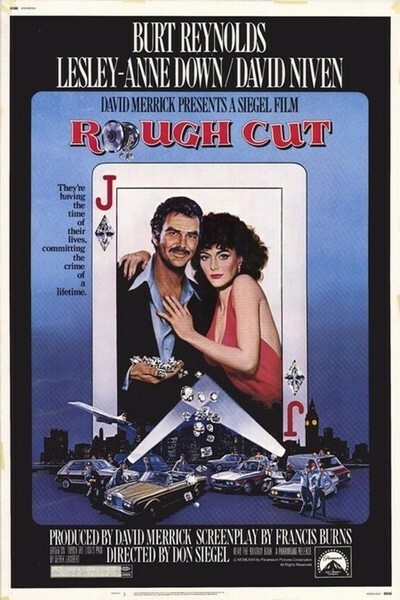 The movie's about a master thief (Burt Reynolds) who meets a beautiful girl at a party, discovers that she's a thief, and falls in love with her. The girl (Lesley-Anne Down) turns out to be more complicated than she seems. She's a kleptomaniac who's being blackmailed by Scotland Yard's chief inspector (David Niven). He's after bigger game he wants to arrest Reynolds as a suitable climax to his career - and he wants to use the girl as bait. So here we have a nice, tricky situation that only grows more complicated when Reynolds begins to suspect what's up, and then, of course, there are all sorts of other developments I wouldn't dream of revealing. This is the kind of double-reverse situation Hitchcock used to like: As the man and woman fall in love, their romantic feelings get entangled with the crimes they're involved in, and the climax involves both ethical and romantic decisions. One of the problems here, though, is that we don't care enough about the chemistry between Burt Reynolds and Lesley-Anne Down. They're assigned to a fencing match of dialogue that's just a little too clever to contain real emotions. We can't tell at times if they'd rather seem honest or clever. Still, David Niven turns in one of his patented performances as the world-weary, brave and cynical establishment figure, although we find at the end we didn't understand him as well as we thought. And the sound track works overtime at establishing the mood: Nelson Riddle has orchestrated the action with arrangements of Duke Ellington classics, which sometimes sound very suave indeed but are sometimes crashingly obvious, as when a parade of police cars is accompanied by "Caravan." There are other references to classical sources. "Rough Cut" has at least three specific references to Hitchcock (the second story job, from "To Catch a Thief," a police car chasing a speeding heroine, from "Notorious," and windmills as a cover for an airfield, from "Foreign Correspondent"). Combine those with the Cary Grant imitation and you have a movie that's being very clear about the category it wants to compete in. But it doesn't make it out of the semifinals.